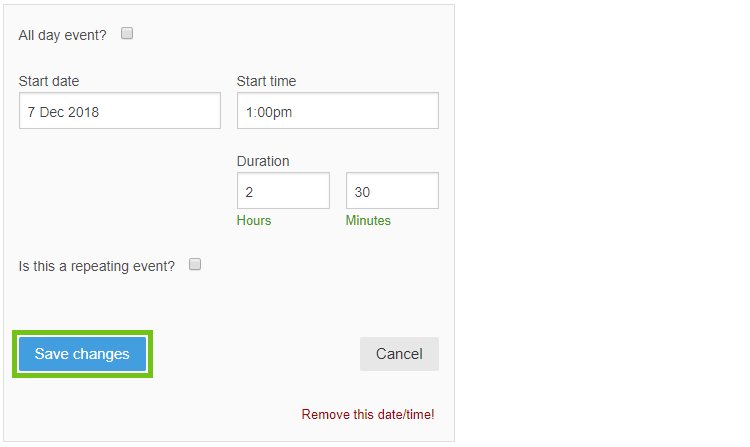 rom the Schedule tab click the relevant class (to select the relevant entry) then click the edit entry button. On the next page navigate to Dates and times and select the relevant event, then click on separate this date/time from the recurrence. Click continue to acknowledge that your date/time will be moved to its own occurrence, and an exception date/time will be set on the recurrence. You may enter a new date and/or time and click save changes to alter the schedule your customers will see on your public page. If the event already contains bookings you can transfer them over to the new event time in the Bookings tab (please see Cancelling and transferring tickets for more information).